The 2009 Milwaukee Brewers had a fairly potent offense. Prince Fielder was playing out of his mind. Ryan Braun was not far behind him. Mike Cameron was still providing value, Corey Hart was about league average. Jason Kendall and J.J. Hardy, while not hitting very well, were playing well enough defensively that they needed to be in the lineup. 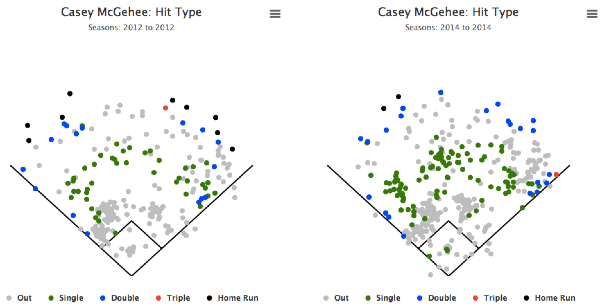 And then there was Casey McGehee. Claimed off waivers from the Cubs in late 2008, McGehee had a banner season in 2009; his 126 wRC+ was good enough for 9th amongst third baseman with 300 PA or more. The Brewers had no pitching that year, and so were out of the playoff race, and by the time Milwaukee made their push in 2011, McGehee was nowhere near his 2009 level. He was traded to the Pirates, then to the Yankees, but could never reclaim his mojo. He signed a one-year deal with the Tohoku Rakuten Golden Eagles in late 2012. He hit 28 dingers in 144 games with the Eagles. This was a good enough performance to earn him a free-agent contract with the Miami Marlins. Then, things got weird. Offense is down this year, as it has been for the past few years, but still, how can a hitter with so little power be 12% better than league average? It’s early in August, but it appears the sky is falling a tad. According to our own Jeff Zimmerman’s xBABIP formula, McGehee is in line for a big regression. Even still, the projections see him at around a .340 BABIP for the rest of the season. This would put him around the top 25 amongst qualified batters, right in Brett Gardner/Marcel Ozuna territory. The projections also see him raising his ISO to the .080 area. Still nothing great. In fact, if the projections hold true and McGehee lands around a .080 ISO and a 109 wRC+, he’ll be in very rare territory. Here are all the players (min. 450 PA) that achieved such a feat in the past 20 years. Notice a trend here? This short list is chock full of speedsters. Because to hit with this little power and yet contribute at this level, players usually have to beat out a lot of ground balls. McGehee throws that game plan out the window and instead, just dumps a bunch of hits into the shallow outfield. Back in the day, if you searched for “Fat Ichiro” on Baseball-Reference (as one is wont to do), Pablo Sandoval’s name came up. This is no longer the case, it seems. However, this paves the way for McGehee to take over the title. While he certainly doesn’t carry the girth of Sandoval, McGehee is still doing a pretty good wolf-in-sheep’s-clothing bit. Except replace sheep with a slender Japanese slap hitter. Which, admittedly, is a weird disguise, even for a wolf. We hoped you liked reading Casey McGehee: Fake Speedster by David G. Temple! Great post David! Who could forget about Jose Vidro!?!? Also, what percentage of McGehee’s singles were LD?